Low Carb diets have been sweeping the nation and with good reason. Who doesn’t like eating cheesecake and losing weight? 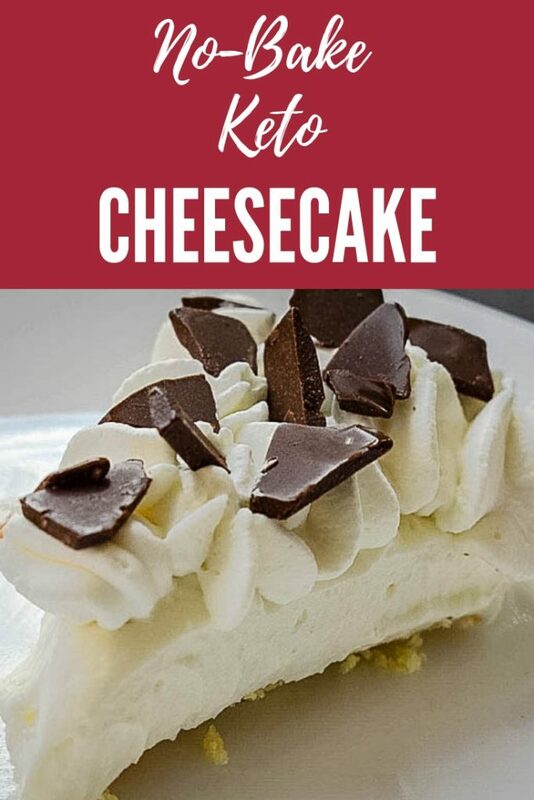 This No Bake Keto Cheesecake is my favorite because it tastes great, but has only about 5 carbs per serving. It also has ZERO EGGS which makes it super light and creamy. Best of all, this cheesecake is incredibly easy to make. 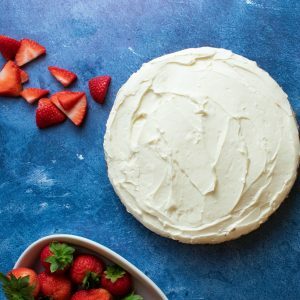 I hope you enjoy this silky, no-bake keto cheesecake as much as I do. Sign up below to get access to our free Keto Snack Guide. It’s the latest short e-book by The Struggle Is Beautiful, and it’s sure to give healthy snack inspiration to both beginner and avid keto dieters. Fat-bomb is a crazy popular buzz word in the keto community. It refers to high-fat recipes like this and many others. These recipes have drawn much criticism from keto critics across the globe (and even avid keto-ers) that picture people “guzzling fat-bombs” thinking it will make them lose weight. The truth is that eating fat will not make you lose weight, and will not even put you in ketosis. However, there is a time and a purpose for these delicious high-fat snacks. High fat has to be coupled with low-carb for you to lose weight. Eating a lot of fat will not put you in ketosis unless it is coupled with low-carb. You have to burn more calories than you eat in order to lose weight. You can’t have an all-you-can-eat diet of fat-bombs and still lose weight. Why Use Fat-Bombs at All? When you first go low-carb and detox from the Standard American Diet, the cravings are intense. This cheesecake recipe helped me through some very dark days in those first months. I remember how bad I craved sugar. I had an addiction, and my drug was peanut butter cups. I’d find myself thinking of all the reasons it would be ok to go to the store, and get just one little snack. Instead, I’d go to the kitchen and make myself a cheesecake. I kept this recipe on-hand about the first 8 weeks of my transition. Now, I rarely make this recipe, or any fat-bombs. 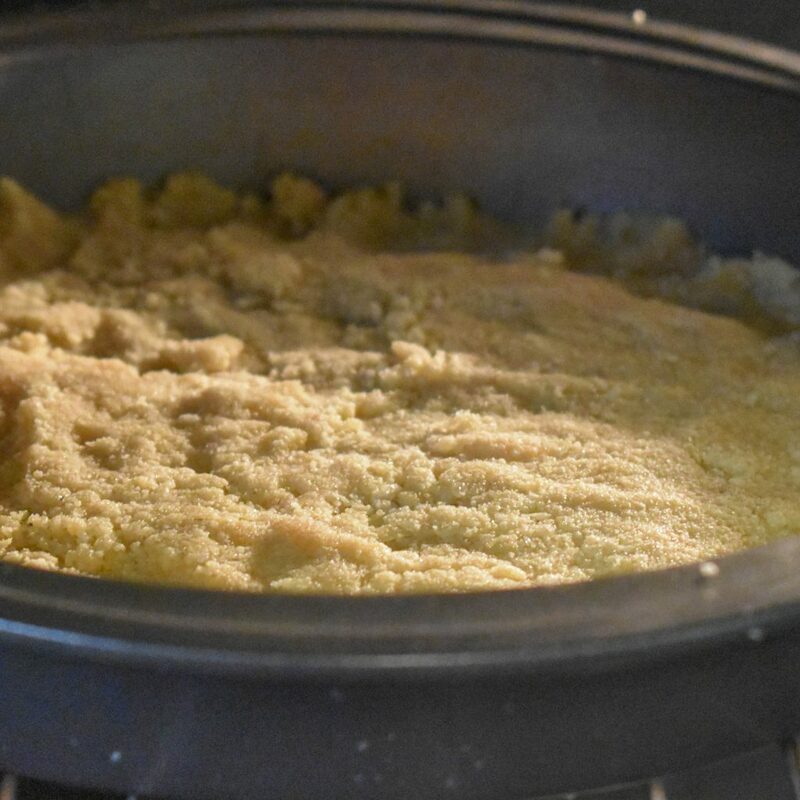 When I attend parties or events where I know there will be a ton of temptation, I use this or one of my other low-carb desserts to keep me on track. Is a keto cheesecake the best food? No. Is it a whole lot better than eating candy and sugar? Yes. Use fat-bombs sparingly to manage cravings. When you first start keto, you should be tracking your macros with an app like Carb Manager. You will need to eat a certain amount of carbs, protein, and fat each day. When you first transfer from the Standard American Diet, it is very hard to eat enough fat. Fat-bombs are great during this transition period, not only to help with cravings but also to help during the learning curve of your new diet. 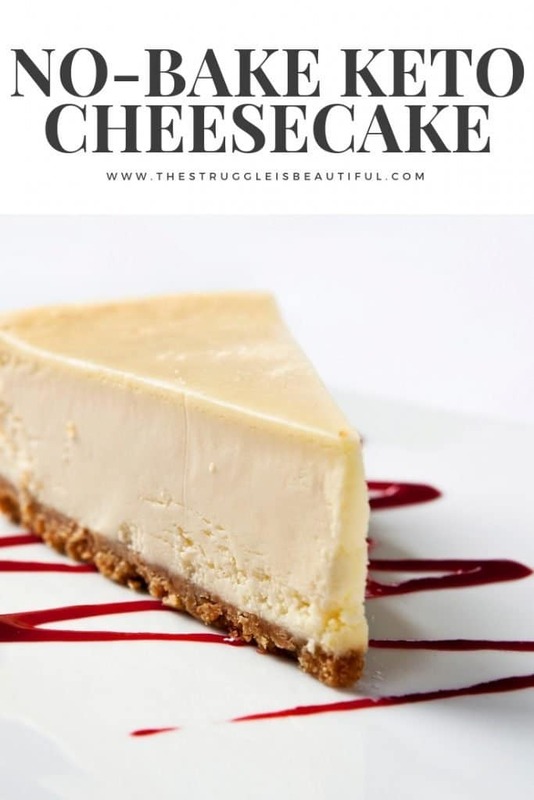 So, fat bombs, like this no-bake keto cheesecake can be an amazing tool to manage cravings and help you hit your macros in the beginning of your keto journey. Note: Always buy full-fat dairy when on the keto diet. Low-fat or Lite Foods almost always replace the fat with extra carbs. First, stir the vanilla, almond flour, swerve, and melted butter together. It should be very thick, like sugar cookie dough. Then, press it into the bottom of your pie pan. I use my fingers for this step, but you could also use a spoon. Next, bake for 10-15 minutes at 350 until toasty brown. While that is cooling, combine your room-temperature cream cheese, one tsp of vanilla and one cup of Confectioners Swerve with a mixer until it is mixed well. It will be thick and creamy. Next, mix in the sour cream. Finally, mix in the heavy cream (Do not beat it first.) Once those are all mixed well, it will be light and have a pudding-like texture. Important: Make sure you mix the cream cheese and sugar first, then the sour cream, and the heavy cream last. This really affects the texture and makes for a smooth consistency. If you dump all the ingredients at once, it gets clumpy. After you mix the filling, pour it on top of your cooled crust and cover it tightly with plastic wrap or a lid. NOTE: Make sure to wait until your crust has completely cooled BEFORE pouring your filling. 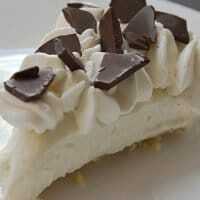 You will end up with a runny mess if you pour the filling on a warm crust. Next, cover the cheesecake with a lid or plastic wrap. The better the seal you get on the cover, the longer it will stay creamy. If it is open to any air, it can get grainy. It’s best to either use a pie pan with an airtight lid or to press the plastic wrap on top of the cheesecake. Finally, chill your cheesecake in the fridge for at least two hours. This silky smooth cheesecake is so delicious no one will ever guess it's low-carb. Stir melted butter, almond flour, 3 tablespoons of Swerve and 1 tsp of vanilla together. Press dough into the bottom of 9-inch pie pan. Bake at 350 for 10-15 minutes until golden brown. 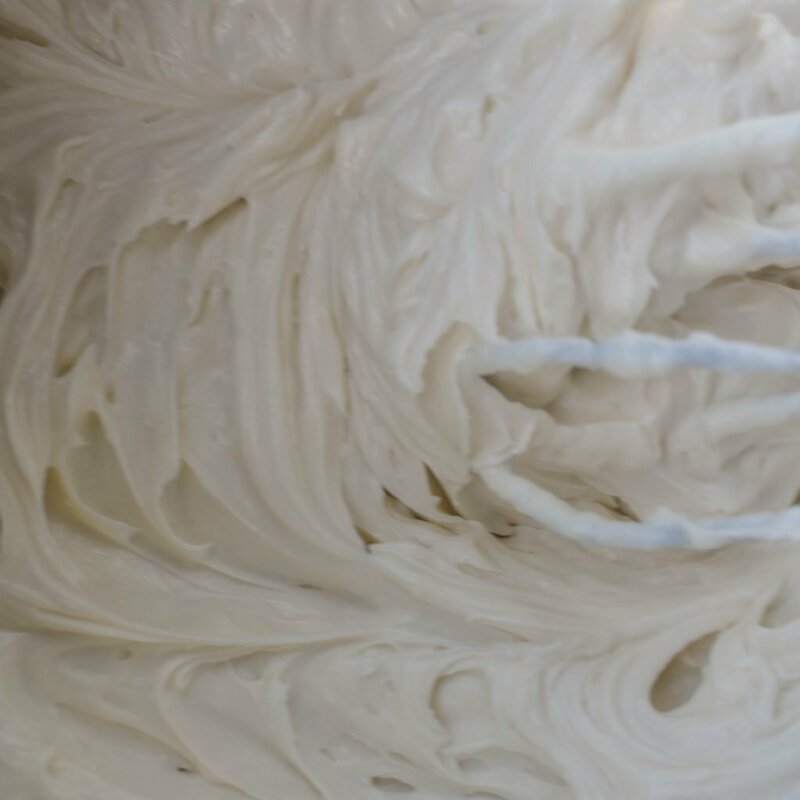 With a hand mixer mix the cream cheese, 1 cup of Swerve, and 1 tsp of vanilla together until creamy and fluffy. Blend in the sour cream and heavy cream until it has a pudding-like texture. *make sure to tighly seal the cheesecake before refrigerating for a silky smooth texture. **Always double check your macros as different brands, products, and apps calculate nutrition differently. I love to top my cheesecake with a couple of tablespoons of homemade low-carb whipped creamand fresh strawberries or chocolate pieces. What are some of your favorite sugar-free toppings? Comment below and let me know what you’ve tried. 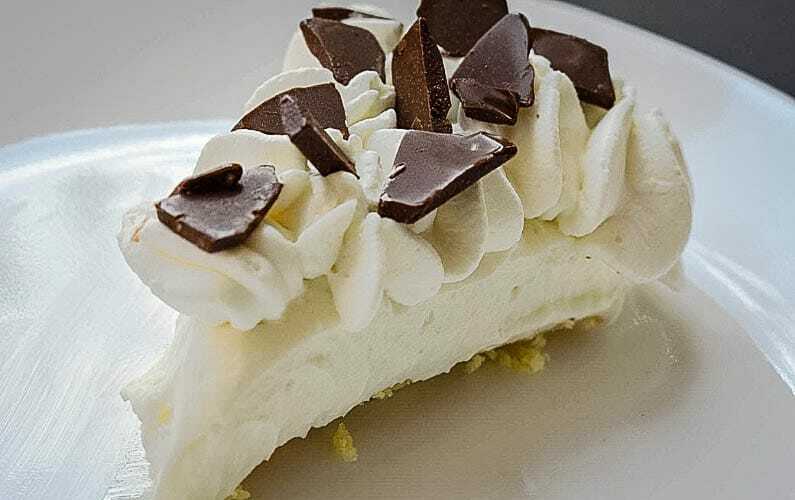 I hope you enjoy this no-bake keto cheesecake, and come back to check out some of my other recipes. Be sure to sign up below for my emails and get other awesome recipes sent straight to your inbox. Best Keto cheese cake so far!!! Thank you! Hi- did you line the pan with something so that the pie could be removed? I don’t for this recipe. It has so much butter that I usually don’t have a problem with it sticking. If you have an issue with it sticking you could line the pan with parchment paper. Do you have an instagram? I made a variation of your recipe and would love to tag you! Awesome! I would love that. Thank you. My Instagram is ms.terrisnider. I entered this recipe into my nutrition calculator and came up with 22g of carbs per serving. What did i do wrong? It’s probably the Swerve/erythritol. A lot of apps calculate it wrong. The nutrition list it as having 4 g of sugar per tsp, but they shouldn’t be counted. It really has o calories and 0 net carbs. The carbs in erythritol are not absorbed and processed by the body, but pass through the body intact. Could I substitute coconut flour? Hi Linda, that’s a great question. I have never used coconut flour for this recipe, but I don’t think it would cook up quite the same. The almond flour has almost a graham cracker consistency, so it is perfect for this cheesecake. I would think coconut flour would make a more “dough-y” crust, and add a coconut flavor to the dish. If you try it out, please let me know. When I’m in a pinch, I just whip up the filling and top it with nuts. Oddly I ran out of Almond flour, and did just this..made up the rest with coconut fl. Will be able to tell tonight after dinner!! I pre~tasted it just a smidg..and tasted pretty darn good!! I’m sure it will be great with almond flour too! Let us know how it turns out. Mine has a grainy texture to it, did I do something wrong? It was fine before I put it in the fridge, but after was grainy. You probably just didn’t get a good seal on the cover. This happened to me once when I covered it with aluminum foil. It’s best to make sure it has an air tight lid. I usually cover mine with plastic wrap, but I make sure to get the wrap all the way down on the top of the cheesecake. It makes it a little messy, but creates a seal that keeps it from drying out. Also, make sure you are using the Confectioners Swerve in the purple and white bag for the filling. The regular Swerve will make it grainy. Third, mixing the ingredients in the wrong order (or all at once) sometimes makes a lumpy consistency. Make sure you mix the cream cheese and Swerve, then add in sour cream, then heavy cream. Hey! In my crust, I mix pecans with the almond flour and it comes out pretty crispy. This is a great idea. Back in my sugar-loving days, I used to make a pie with pecans in the crust. I don’t know why I didn’t think of this. Thank you! I have been looking for a keto dessert recipe that tastes good. I ended up making these last night and they were amazing! My whole family loved them. I did garnish them with lily’s dark chocolate! I also made them in the mini cupcake wrappers so we could just grab them as a quick dessert. These are for sure a keeper and probably going to be my thanksgiving dessert this year! I am so glad you like them. Putting them in a cupcake wrapper is a great idea! It will even help you control your portions. I made this cheesecake for a staff potluck and everyone was amazed and said it was way better than regular cheesecake. Thank you so much for sharing this delicious recipe! Awesome! I’m so glad everyone liked it! I added lime to the cream cheese mixture and it was even better. I also put 1cup of almond flour and half a cup of coconut flour because my pan is small… And almond flour is expensive. It was AMAZING. Do you whip the heavy cream before adding it to the mix or do you just add it as a liquid? No, don’t whip it, just add it as a liquid. Hello. Can u tell me how long in advance u think this can be made…or how long this holds up in the fridge? I wouldn’t make it any longer than a day or two ahead of time. I usually keep mine about eight days, but by the end of about a week, it’s a little grainy. THANK YOU!!! Every keto dessert I’ve tried to make has always turned out so dang eggy and inedible. I almost gave up until I found this recipe and decided to give it a whirl. It’s amazing and will now be our go-to dessert. Great! I’m Glad you like it! Thanks. Looks delicious and I can’t wait to try it…literally! Lol! Do you think substituting the sour cream with plain Greek yogurt would throw the recipe off? I’m out of sour cream?! Greek Yogurt has less fat and more protein than sour cream. So, I’m sure it would be plenty healthy. I just hope it doesn’t give it a bitter taste. Let me know how it works out. Any idea on how long this would keep in the fridge..im thinking of making ahead for xmas dinner. So sorry for my late response. This message must have gotten looked over. I wouldn’t make it longer than a couple of days ahead, although, I have had it last up to a week. That is wonderful. I’ll bet pecans are a delicious add in. I love to use pecans in my Pumpkin Pie crust. What are the macros and serving per pie? There should be a Nutrition Facts box after the recipe, that includes any of the info that you need to track. This cheesecake is set up for eight slices, and 3.3 net carbs, and 37.9 grams of fat. I hope this helps. Mine came up so much more….I put it into my Carb Calulator and it says it was 54g of fat and 14 carbs ? Came out great! I put sugar free jelly/jam on top yum! Great! It’s so good with jelly. That’s a great idea! Hello, will the filling thicken/ to cheesecake texture as it sets in refrigerator? It was wonderful and creamy as I poured it in the pie pan! It will thicken, but not exactly like a regular cheesecake. It has a pudding-like consistency even after being refrigerated. Yes, the Swerve usually messes up the carb count. This has 4.1 total carbs, and 3.3 net carbs. I made this today, and on a whim I added a splash of my sugar free smores torani syrup and sprinkle of cinnamon to the crust, gave it a real Graham taste. So good! Thank you!! What a great idea! I’ll bet it was delicious. Thank you tastes amazing I just made the filling and put it on top of keto peanut butter brownies!! I am so glad your husband likes it. I’ll bet the strawberry syrup you made is to die for! Really am not sure what I did wrong except I use my new kitchen ninja kitchen master. The crust was good. The flavor was awesome. But it’s not a thick pudding. Maybe more of a runny pudding. We’re eating it. It still taste great. Just not the consistency I was hoping for . Oh No! I’m so sorry! I’ll bet you’re right, and it was the Ninja. It is possible to over-mixed the filling, and it will come out runny. I entered the recipe in my app (8 servings) and it came up with 6.9 net carbs, 49.4 fat, 544 calories and my app calculates swerve at 0 net carbs. Can you please let me know how you got 3.3 net carbs and 380 calories per serving? I spent my whole morning trying to figure this out. Me with a calculator, first thing in the morning is not a pretty sight. I normally use an online nutrition calculator to create my nutrition facts. I double and tripled checked it again this morning and came out the same. I think that I have found the discrepancy, or at least most of it. All almond flours are not equal. I used Bob’s Red Mill when I calculated this, and it’s all I will use from now on. When I calculated with other brands of almond flour (including the affordable one I like to buy from Walmart) I ended up with numbers much closer to yours. Thanks for looking into it for me!!! I’m not sure what the discrepancy is… initially I used Costco brand almond flour then used Bob’s and the net carbs are 12.9 with Bob’s ? I then used Philadelphia light cream cheese with Costco flour and the numbers went down to 5.4 net carbs. Are you using low fat items or organic? Just trying to figure out the difference between your and mine ? I think I’ve figured out where the carbs are off. Never use the light versions when you’re on keto. Always use full-fat. Light items have more carbs. When they take out the fat, they add sugar to help it taste better. Regular Philadelphia Cream Cheese has 0 carbs and light has 2. I always use full fat and organic when I can. I still don’t understand why it went up with the Bob’s. Maybe it’s just the specific kind of almond flour we’re choosing. I made this for the 1st time yesterday and it did not disappoint! I was nervous about trying it but it satisfied the sweet tooth I have while still not going over my carbs. Hey, going to give this a try today! Did you just use a hand mixer for the filling? Yes, a hand mixer works great for this recipe. Hope you like it! I am making this now. I love the flavor of regular cheesecake with the almond extract, so that is what I am using in place of the vanilla for the filling. I will post later how it turns out. I’ll bet that will be wonderful. Please let us know how it is. Hi – do you use the confectioner type Swerve in the crust and the filling? Thanks! I use regular Swerve for crust, and confectioners Swerve for filling. Confectioners Swerve works alright in the crust, but regular swerve does not work in the filling. There is no way this is low carb. Oh my goodness gracious, it is heaven!! I feel so guilty. Absolutely wonderful!!! How do you make it so its not so soupy? I made it just like the recipe said and I let the filling sit most of the day before serving and when I went to serve it it was really soupy. Do I need to add less heavy cream? It usually isn’t even soupy when you put it in the fridge, just not firm. I think it’s a problem with over-mixing. I had one other person with this problem, and they were mixing in a food processor. What are you using to mix the filling? Maybe try using a lower speed. Adding less heavy cream will make it thicker, but it also won’t have the silky pudding-like texture. Let us know how it works out, and feel free to email me at terri@thestruggleisbeautiful.com. OMG this cheesecake is sooo good and I even made it Vegan I used only vegan ingredients it turned out soo good. Thanks for the recipe so simple and simply delicious ?! That sounds so interesting. We’d never have the ingredients to make vegan cheesecake in my rural neighborhood. I’m so glad you like it. Question: can this be frozen? We won’t be able to eat it all in a couple of days. Has anyone tried freezing it? I have never frozen this recipe, but I will try this weekend. Let me know how it works out if you try it first. The recipe notes granulated swerve but the ingredients noted in the post say confectioners swerve. You use granulated swerve in the crust, but confectioner’s for the filling. If you’er in a pinch you can use confectioner’s in the crust. Hope this helps! It usually lasts about a week before it starts to dry out and get grainy. Get as tight of a seal on it as possible, and it will last longer. This is amazingly easy and delicious! I used half the powdered swerve and a few drops of strawberry stevia and this is sweet enough for me. I added a bit of apple pie spice to crust as well. I didn’t find the filling too soft at all. If you have ever made the cream cheese, whipped cream cherry cheesecake with graham cracker no bake cheesecake ,it tastes just like it! That sounds delicious! I didn’t even know they made strawberry stevia until just now. I’m definitely ordering some. I’m so glad you like the recipe.